I am not a vet. Just a pet owner trying to work out the best, most holistic care for my animals focusing on raw feeding and using all the resources at our disposal. Well, folks. We may have a couple of setbacks. On the one hand, Andre seemed to handle turkey necks and drumstick meat quite well. Then we took a few days' break and tried a blend of ground drumsticks, pork hearts and pork liver. 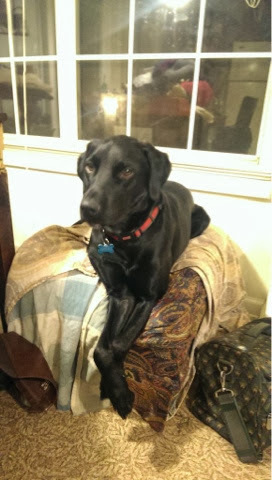 He did ok with this, too, if slightly gassy. We only did this for a few days. First issue is that unenhanced turkey is hard to get, so DIY will be tougher, but the blend is cheaper than Bravo. Now, he's been slightly off, has lost a couple of pounds, I think, and has started trying to eat the other dogs' poop again. It's been many months since that was a problem. One change that might be to blame is that I've been out of yogurt quite a bit the last month, so he's had a lot of cottage cheese in his kongs. The only probiotic that he currently gets is the small amount in Missing Link. I'm hoping that the cottage cheese and/or the lack of probiotic is the problem. Until I can get some keffir, he will get more yogurt in his kongs and a powder probiotic-- we're giving 21st Century a shot (from Petsmart). 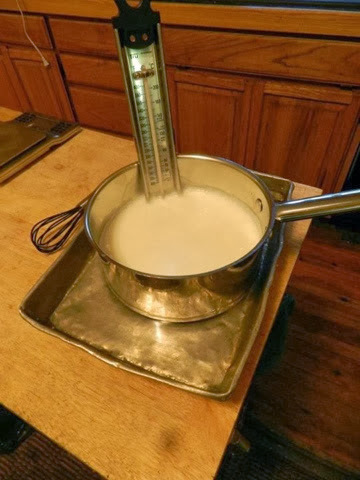 In the meantime, I thought now would be a good time for yogurt making instructions. With 4 dogs who get frozen kongs several days a week, and humans who like to cook Indian food, making your own yogurt is super economical. 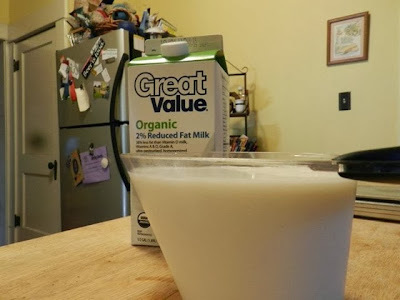 It also gives you lots of control over the texture, consistency, and sourcing of your milk. 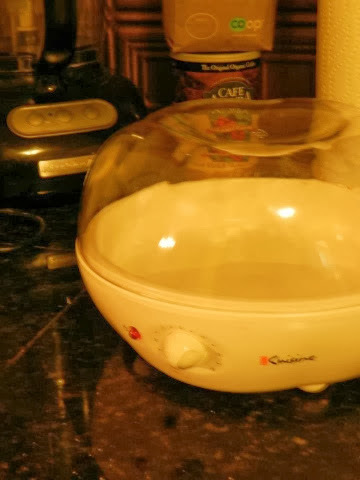 We use a yogurt maker. It's not required, but it's not expensive and makes life a little easier. It pays for itself pretty quickly. This is a Eurocuisine model with a timer. It was maybe $30 or less and simplifies the final step of the process. It came with 7 little 6oz cups, but one big bowl of plain makes more sense for us. This model is one big open space, so you're only limited to the size that will fit under the lid. We use a 7 cup glass Pyrex container. ...and pour it into the container. It can sit there sterilizing while I get the rest of it going. For this batch, I have 42 ounces of organic 2%. It's ultrapasteurized, and I hear that makes for lesser yogurt. I haven't noticed, but I hope to try with local milk at some point. Also, full fat is going to be automatically creamier, but since this batch will be used for all of us in the house, I don't want the full fat. You will also need some plain yogurt as a starter culture. If I have some of my yogurt, I use that, but I just buy a single small container of plain at the store to get started. 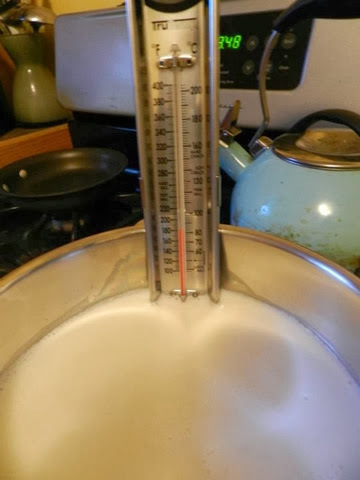 I bring the water to 185 degrees-- this sterilizes the milk one more time and apparently does something to break down the whey. 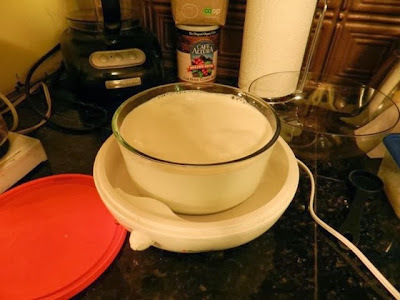 It's unnecessary (we never did this when I was a kid and made yogurt), but I think it probably speeds up the process and supposedly makes for creamier yogurt. I like to keep it at 185 for 10 minutes. I didn't always do this, so obviously it's unnecessary. I keep it on medium high until I hit 180 and then turned it to low for the next 10 minutes. 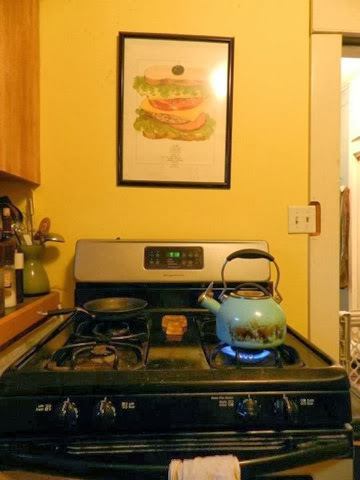 Some folks use a double boiler, some keep it at 180-185 for 30 minutes. I just do 10 minutes and I definitely noticed an improvement in the results- firmer yogurt with less whey. 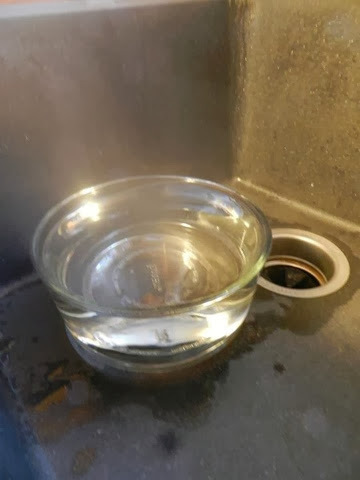 You can next turn off the heat and wait for it to go down to below 120 degrees... Or you can put it in a nice bath to speed up the process. I've always done the ice bath. I'm impatient that way. 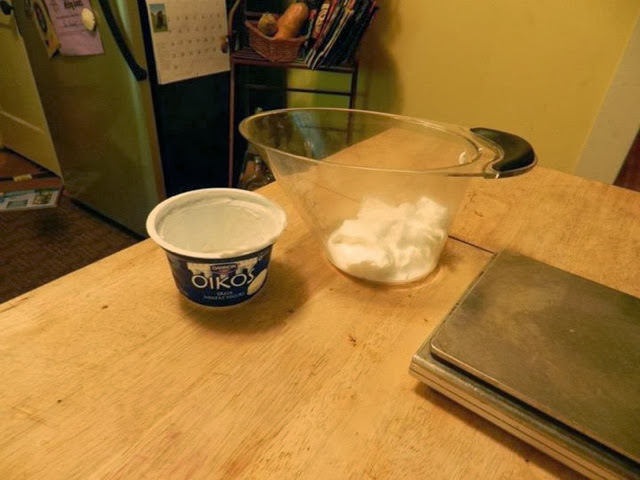 While the milk was heating, I put 5-6 ounces of plain yogurt into my measuring container. Use any plain yogurt or you can buy starters at most health food stores. 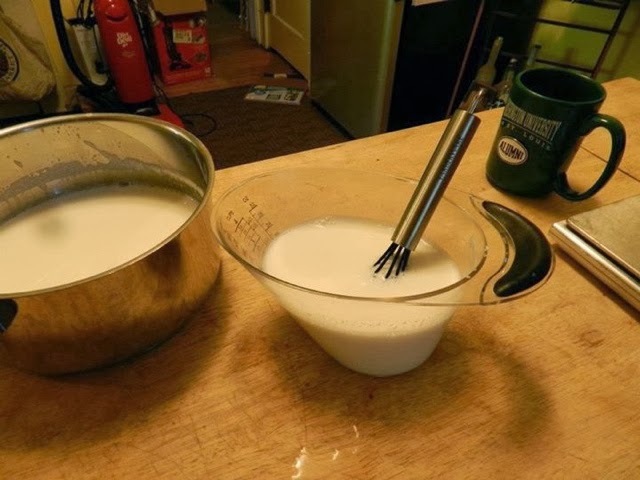 Now that the milk is cool, pour some of that milk into the measuring cup with your starter and whisk lightly. Then pour it back into the warm milk and stir it lightly. 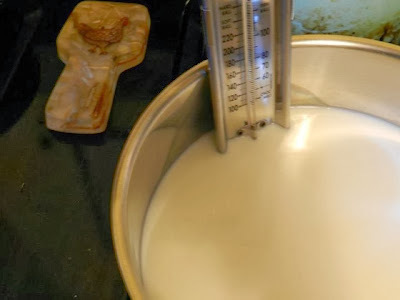 Empty the sterilizing bowl, place it in the machine, and pour up the milk. For full fat milk, I usually set it for 8-10 hours. This is 2%, so I'm giving it 11-12 hours. After it's done, chill it. If it's still not thick enough, it can be strained in a cheese cloth or in a colander lined with coffee filters. 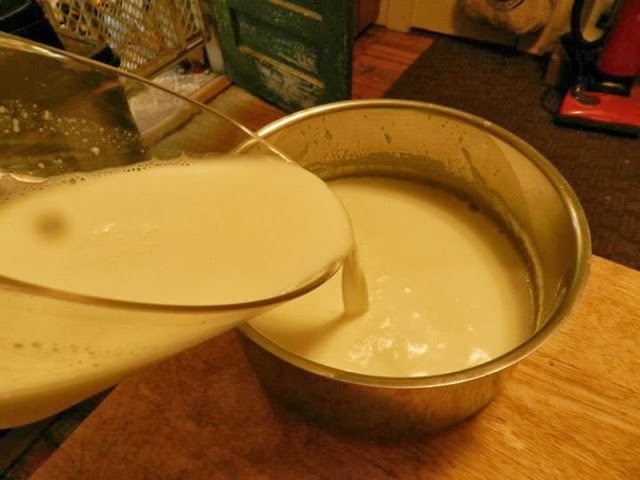 Save the whey, though-- it makes a great substitute for buttermilk in baking and can be used to add extra protein to smoothies, especially those that you'd rather not use yogurt in. If you don't want to spring for a machine, just know that the important thing is to keep it around 110degrees while it's culturing. 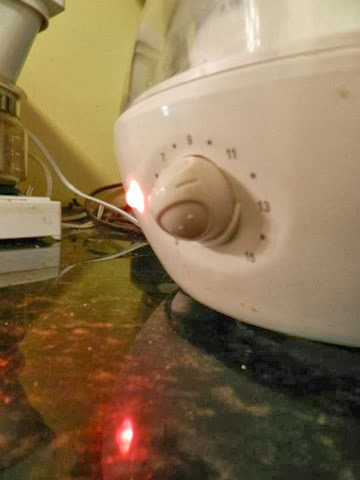 Some folks use water baths in crock pots or keeping it in thermal containers, in warm ovens. Whatever works for you. For the $20-$30 the machine costs, it was worth not having to deal with that stuff.